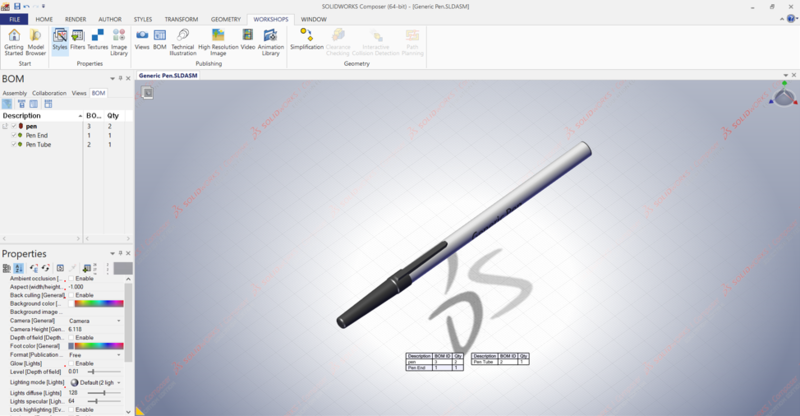 SolidWorks Composer is a program by SolidWorks that works with your existing 3D data to create graphical documents for technical communication. It primarily uses created “Views” of models to show different aspects of the model and its components. SolidWorks is a complete CAD package to be sure, but very few would think of it as a software used to communicate with anyone that isn’t an engineer or designer. Options for communicating designs from this software are often considered to be 2D drawings, or documents made using various, manually taken screenshots. 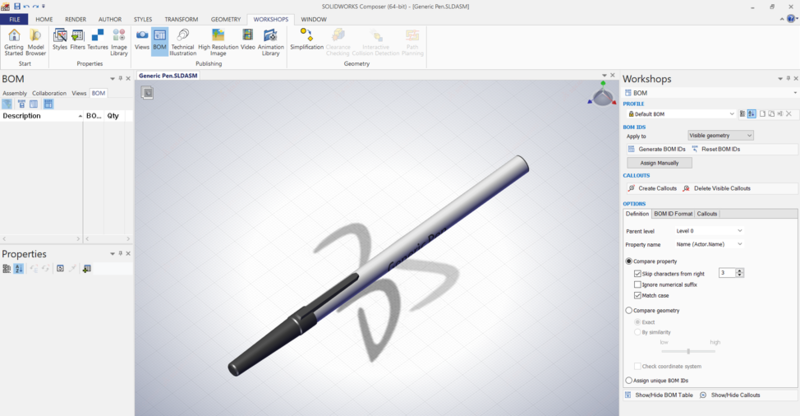 There is, however, a lesser known tool designed to help engineers and designers communicate the designs that they create through SolidWorks in a way that makes sense to more people. Enter SolidWorks Composer. SolidWorks composer is a program for quickly creating graphical content for the purpose of technical communication. SolidWorks composer is an extensive system and learning to use all of the features takes time, but in the following article, we highlight some of its basic functionality to give you an idea of what the composer is capable of and how to get started using it. SolidWorks Composer is a powerful tool. To understand it better, will we start with the basics of how to access the composer, then talk about its capabilities with existing 3D models. First it is important to note that while SolidWorks Composer is fully compatible with the rest of SolidWorks ecosystem, it is a completely separate program from SolidWorks itself. 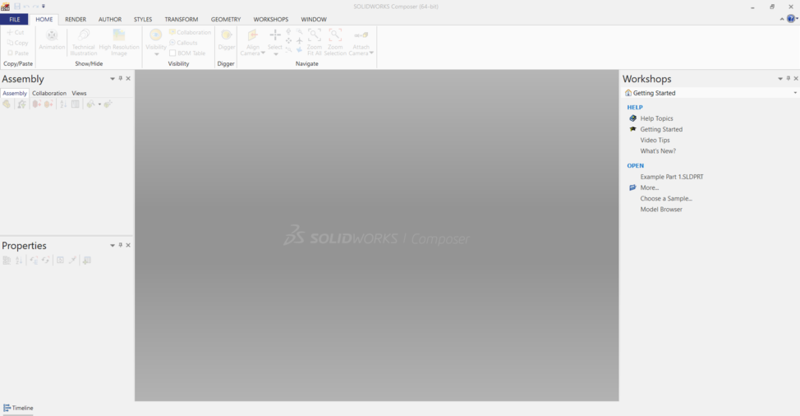 Upon opening SolidWorks Composer, you can immediately start to see how it feels similar to the SolidWorks user interface. This familiar layout is where most of the similarity comes to an end. 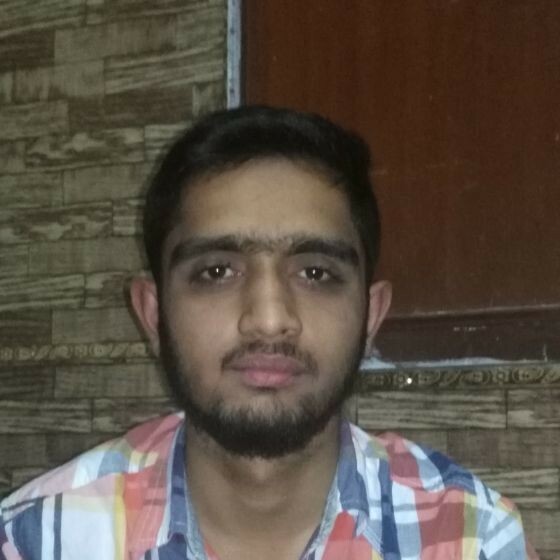 Moving forward even familiar functions will have different names and it is important to keep in mind that changes made in SolidWorks Composer do not affect the SolidWorks file that you imported into this window. 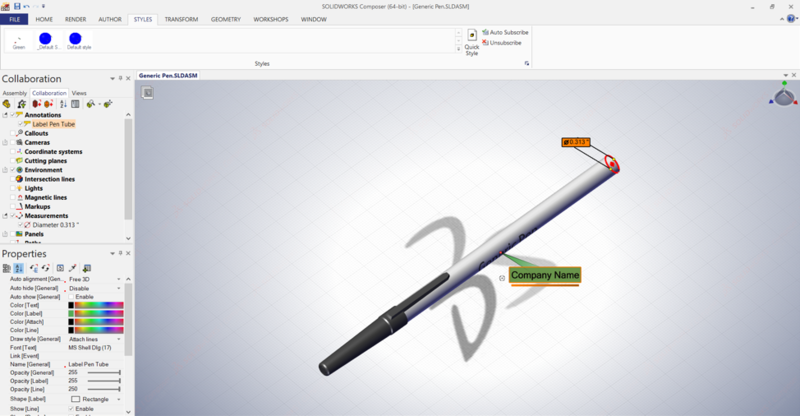 To bring a model in to the viewport we open it just as we would if we were in the standard solidworks environment. Once a model is open, you can start using the composer tools. SolidWorks Composer is not limited to the use of simple transformations to show the intent and function of a design. 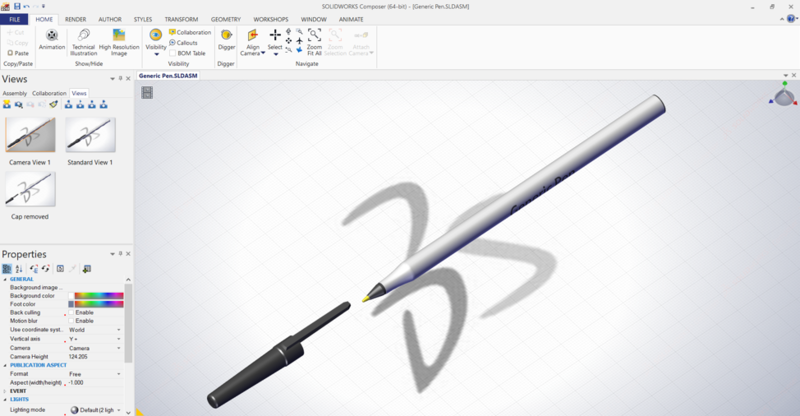 There are more tools available than there is time to look at in a short article such as this, but to give you a taste of what SolidWorks Composer is capable of, we will cover a few notable options. To take a look at some of these options, let’s look at the tabs across the top of the SolidWorks Composer toolbar. The first tab we see is labeled “Home.” There are many options here for us to consider but perhaps the most versatile is the digger tool. This tool creates a small window over the part and contains a number of options as shown below. The upper left buttons, determine the effect that the digger tool will have. The slider on the right side determines the extent of the effect, and the options along the bottom allow you to alter the way that the window appears. Another set of tools that can be helpful for communicating your design is the options within composer to fully annotate a design. These tools are mostly contained within the “Author” tab. These tools tend to pertain to things that add notation to the view in the viewport. As an example, we added the tube diameter and a label to the side of the pen. If you decide later, you can hide things like annotations and measurements using the Collaboration tab in the window on the left of the screen. 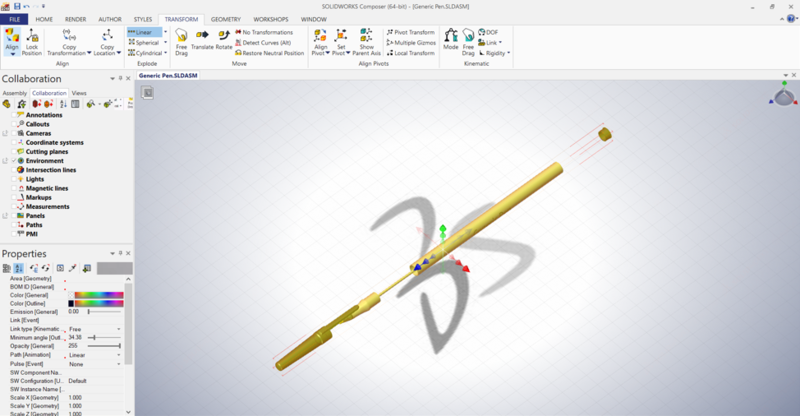 Within SolidWorks Composer, the visual attributes of things like labels and dimensions are what is referred to as “styles.” You can adjust the style of each individual item (which the composer refers to as “actors”) by clicking on them and adjusting the properties in the window on the left side of the screen. Once you’ve adjusted those properties, you can select the actor, and use the “Quick Style” button on the “Styles” tab to save it. It can then be assigned to other items. In the example above, we made adjustments and then saved the style as the title “green.” With all the tools available to us, we can now assign this to other items, an even set it as default so that future items default to this to this style in the future. We have previously discussed some of the features of the transform tab. The tools contained in this tab can be used to move individual components of an assembly around the viewport to create new views for clarity. One important tool that exists in this tab is the explode suite of tools. By selecting all the relevant components and a explode method, we can create an exploded view all at once. Next to the transform tab is the geometry tab, which can be used to change or add to the geometry of what is in the viewport. These are more specialty tools, so we won’t spend much time talking about them in this article. The next tab we come across is labeled workshops. 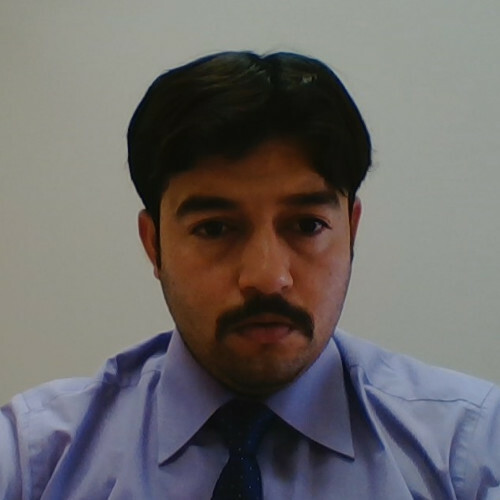 This allows us to access complete option sets of different suites of tools. 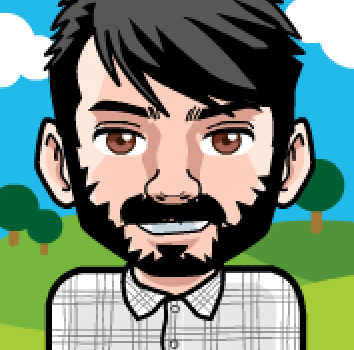 You will already recognize that complete “Styles” tool set can be accessed from here. Another tool here that can be invaluable is the “BOM” tool. This tool allows us to insert a bill of materials. As you can see above, the window that opens when we select the BOM tool has many options. Understanding these different options is important for getting the bill of materials that you expect. Regardless of the options that you choose to select for your BOM, the final result is displayed in the viewport as shown below. In this case there are very few parts selected to be listed, but for much larger assemblies this tool can be extremely valuable. The next tab controls the viewport or the “Window.” This can be used to control the appearance of the window, as well as how to manage having more than one window open at a time. Finally lets jump back to the beginning to look at the “render tab. 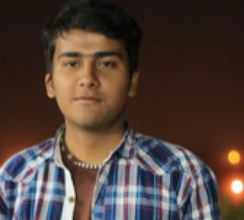 Getting a quality render, can be an art and a science in and of itself, and the techniques used to render are well beyond the scope of this article. 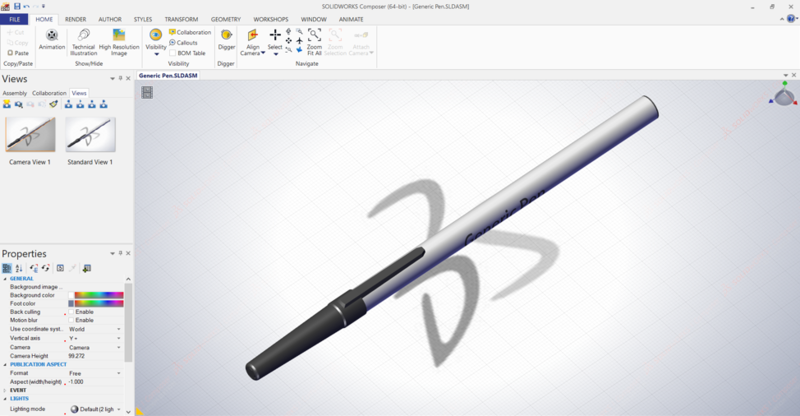 Just know that this software contains a full set of render tools that play with the rest of the SolidWorks Composer ecosystem. Once you have a better grasp of all these settings, we explore the final step in preparing information with the SolidWorks Composer. 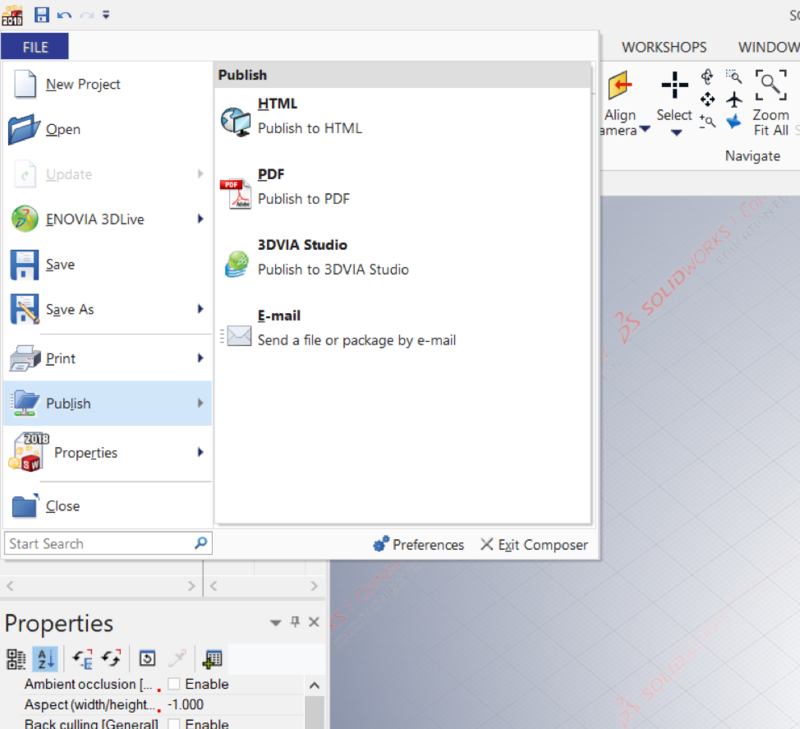 Once you have your SolidWorks composer document set up the way that you want it, you can export the information you have prepared in a number of different formats for sharing with collaborators. This is accomplished using the file tab as shown below. As you can see in the image above, we can publish this in many different formats. 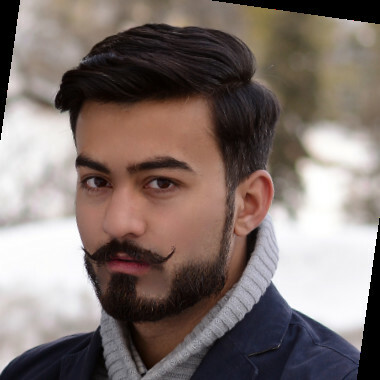 Do note that many of these options, including the PDF, do require plugins or other software from SolidWorks to fully utilize. Each of these options is full of customizations that can adjust how your information is presented and we recommend a thorough examination to decide what method is right for presenting your information. 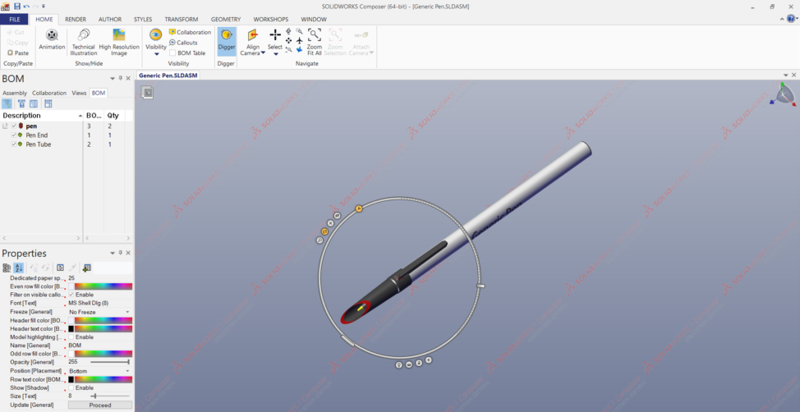 SolidWorks Composer is SolidWorks’ answer for to communicating design intent within the SolidWorks ecosystem. Good design is fundamental to a successful project but being able to communicate that design can be just as important. 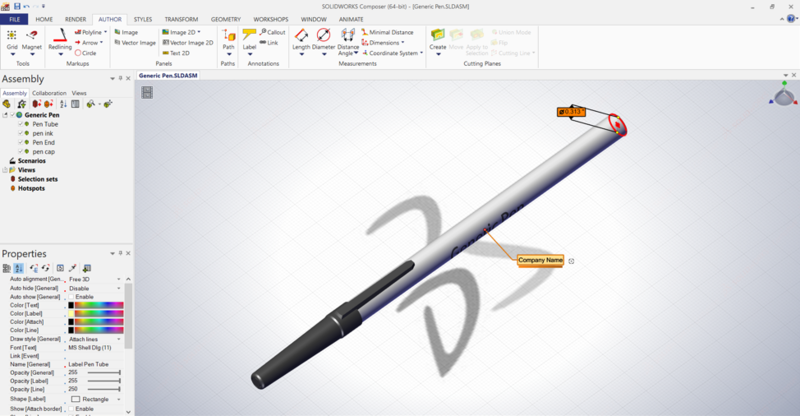 The ability to use the same 3D data, within the SolidWorks ecosystem, to create clear and concise files to share with collaborators is a game changer when it comes to communicating your designs.